Pay attention to the type of pain you experience since some causes for pain behind the knee warrant a trip to the emergency room. Miho Tanaka, MD, associate professor, Department of Orthopaedic Surgery at the Johns Hopkins Hospital says to watch out for blood clots, numbness and weakness in the leg, and fevers and redness associated with swelling. Blood clots should be quickly evaluated, and tingling or numbness that makes it hard to walk are also a sign to go to the ER, Dr. Tanaka says. Although swelling in the knee has many causes, in rare cases, it could be a sign of an infection, so it’s a good idea to seek immediate care. Steven Lyons, MD, for Florida Orthopaedic Institute, adds knee pain experienced after a major trauma like a fall or a car accident are also appropriate times for an ER visit. 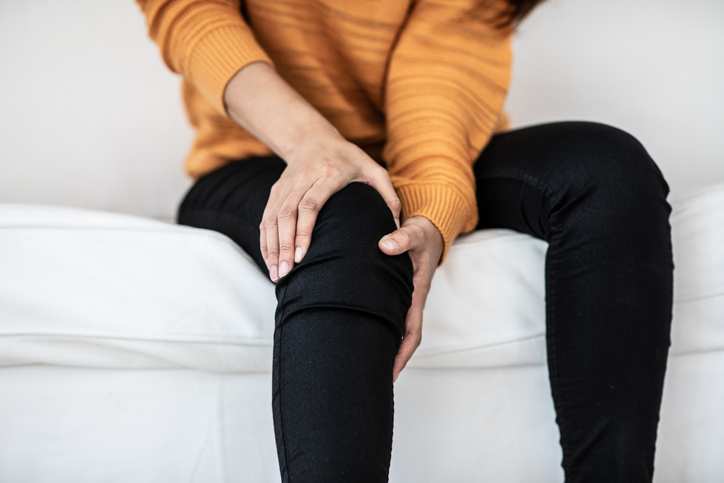 If the knee pain lingers longer than a week or two without any prior injury, Dr. Lyons recommends visiting a doctor instead. According to the American Academy of Orthopaedic Surgeons, meniscus tears are among the most common knee injuries. The meniscus act as “shock absorbers” between your thigh and shinbones. Someone with a torn meniscus might feel a “pop” along with pain, stiffness, and catching or locking the knee, according to the academy. Here are the 9 best moves to end knee pain. Arthritis and gout, inflammatory arthritis, could cause pain behind the knee as well as a few other types of arthritis. Osteoarthritis is the most common type and breaks down the cartilage or cushioning between joints, according to the Arthritis Foundation. Psoriatic arthritis also contributes to knee pain as well as autoimmune diseases such as lupus and rheumatoid arthritis, according to the National Psoriasis Foundation and Johns Hopkins Medicine. It’s named after the surgeon who first described it, William Morrant Baker. Dr. Lyons explains a Baker’s cyst as a collection of fluid that goes from the front of the knee to the back of the knee and is accompanied by arthritis or a meniscus tear. Dr. Tanaka adds a Baker’s cyst is often a sign of an underlying knee problem and can be quite uncomfortable. “This will typically go away with management of the underlying source of the swelling; treating the arthritis, etc.,” she says. These are the 9 proven knee pain treatments you kneed to know. Sudden activity and overuse are two leading causes of pain behind the knee due to a calf or hamstring strain or cramp, according to Dr. Tanaka. Movements that require pushing off or severe knee bending cause this calf and hamstring pain, respectively. “Both can be managed with ice, rest, gentle stretching and anti-inflammatories; however, one should seek care if there is swelling or persistent pain associated with this to rule out blood clots,” Dr. Tanaka says. Dr. Lyons adds that although an orthopedist could treat this, if you can’t bear weight on the knee or are at risk of falling, then it’s time to go to the emergency room. Jumper’s knee is an “overuse injury,” according to the Nemours Foundation. For example, athletes and kids are especially at risk of injuring this chord-like tissue when repeating irritating movements like jumping, hard landings, or changing directions too quickly. These movements could all cause strains, tears, and damage to the patellar tendon, also known as jumper’s knee, per Nemours Foundation. Pain, stiffness, and even weakness are a few symptoms of this injury. A doctor might simply prescribe rest and ice or surgery, in rare cases. These are the 6 hidden muscles that could be causing you pain. Various ligament injuries could contribute to behind the knee pain. This includes a partially or entirely torn ACL (anterior cruciate ligament) or MCL (medial collateral ligament), according to VeryWell Health. ACL tears are common with athletes. The ligament tears or stretches while twisting with planted feet. MCLs tear when something strikes the outside of the knee, forcing it to buckle. Along with many other knee injuries, both require the RICE treatment approach: rest, ice, compression, and elevation to reduce both pain and swelling, according to Mayo Clinic. Next, check out 24 secrets pain doctors won’t tell you.